FoxM1 (forkhead box protein M1) protein is a member of the Fox (forkhead box) family of transcription factors with known roles in regulating cell cycle progression. 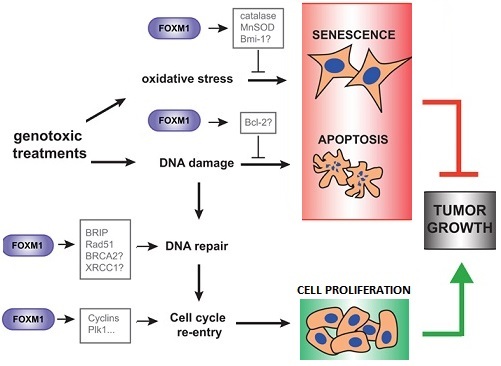 FOXM1 is a master regulator of cancer cell growth and is overexpressed in a majority of cancers, while its expression usually low in normal cells. Elevated FoxM1 expression is found in cancers of the liver, prostate, brain, breast, lung, colon, pancreas, skin, cervix, ovary, mouth, blood and nervous system. In addition, FoxM1 may drive tumor invasion, angiogenesis, and metastasis. For these reasons, FoxM1 is an attractive target for anticancer drugs such as doxorubicin, epirubicin and cisplatin. FoxM1 is a downstream component of Wnt signaling and is critical for β-catenin transcriptional function in tumor cells. Wnt3a increases the level and nuclear translocation of FoxM1, which binds directly to β-catenin and enhances β-catenin nuclear localization and transcriptional activity. FoxM1-β-catenin interaction controls Wnt target gene expression and thus, FoxM1 mutations that disrupt the FoxM1-β-catenin interaction (or FoxM1 nuclear import) prevent β-catenin nuclear accumulation in tumor cells. Targeting FOXM1 in mono- or combination therapy has promising therapeutic benefits for the treatment of cancer. FOXM1: From cancer initiation to progression and treatment. FOXM1 (Forkhead box M1) in Tumorigenesis: Overexpression in Human Cancer, Implication in Tumorigenesis, Oncogenic Functions, Tumor-Suppressive Properties, and Target of Anticancer Therapy. FoxM1 promotes β-catenin nuclear localization and controls Wnt target-gene expression and glioma tumorigenesis. Location, location, location: FoxM1 mediates β-catenin nuclear translocation and promotes glioma tumorigenesis. Forkhead box M1 transcription factor: a novel target for cancer therapy. AMPK (AMP-activated protein kinase) is a metabolic sensor with a key role in metabolic disorders and in cancer. AMPK is also a metabolic tumor suppressor. Because AMPK activation inhibits most biosynthetic pathways and causes cell cycle arrest, it should also have a cytostatic, tumor suppressor effect. It has been shown that activation of AMPK reduces cancer cell growth through blocking the Wnt/β-catenin signaling activity. Increased AMPK activity suppresses FoxM1 expression. Bitter melon extract (BME) is a natural AMPK activator. BME has been found to possess anti-cancer activities via its ability to increase AMPK activity. AMP-activated protein kinase: a cellular energy sensor with a key role in metabolic disorders and in cancer. Activation of AMPK inhibits cervical cancer cell growth through AKT/FOXO3a/FOXM1 signaling cascade. The tyrosine kinase receptor, HER2 is a crucial prognostic marker and therapeutic target for breast cancer and the hormone EGF (epidermal growth factor) normally activates it. HER2-overexpressing metastatic breast cancer is extremely resistant to treatment. The biotech company Genentech developed a monoclonal antibody called Herceptin (trastuzumab) that interferes with the HER2/neu receptor. FoxM1 mediates resistance to Herceptin and chemotherapy agents such as paclitaxel. Genistein, a major component of soybean products, is considered a general or broad-base tyrosine kinase inhibitor. Genistein is as effective as Herceptin in inhibiting the growth of advanced breast cancer cells. Both Genistein and DIM (3,3′-diindolylmethane) inhibit FoxM1 activation in cancer cells leading to apoptotic cell death. DIM is a natural compound present in food plants of the Brassica genus, including broccoli, cabbage, Brussels sprouts, cauliflower and kale. FoxM1 is a downstream target and marker of HER2 overexpression in breast cancer. FoxM1 mediates resistance to herceptin and paclitaxel. Over-expression of FoxM1 leads to epithelial-mesenchymal transition and cancer stem cell phenotype in pancreatic cancer cells. FoxM1 is a novel target of a natural agent in pancreatic cancer. 7-difluoromethoxyl-5,4′-di-n-octylgenistein inhibits growth of gastric cancer cells through downregulating forkhead box M1. Apoptosis induced by 7-difluoromethoxyl-5,4′-di-n-octyl genistein via the inactivation of FoxM1 in ovarian cancer cells. Gene expression profiling revealed survivin as a target of 3,3′-diindolylmethane-induced cell growth inhibition and apoptosis in breast cancer cells. Emerging evidence suggests that crosstalk between the androgen receptor (AR) and β-catenin is critical for the development of prostate cancer and the progression of prostate cancer to castrate-resistant stage (also called androgen-independent or hormone refractory). Together with the increased expression of AR and β-catenin, there is increased nuclear colocalization and interaction of endogenous AR and β-catenin in castrate-resistant prostate cancer. AR promotes translocation of cytoplasmic β-catenin to the nucleus and thereby increases AR transcription and regulates Wnt. Therefore, modulation of β-catenin signaling attenuates the aggressive behavior of prostate cancer cells and induces apoptosis. Androgen activates β-catenin signaling in bladder cancer cells. Mechanism of β-catenin-mediated transcriptional regulation of epidermal growth factor receptor expression in glycogen synthase kinase 3 β-inactivated prostate cancer cells. The androgen receptor can signal through Wnt/beta-Catenin in prostate cancer cells as an adaptation mechanism to castration levels of androgens. Clinical Significance of Wnt/β-Catenin Signalling and Androgen Receptor Expression in Prostate Cancer. A recent study suggested that lowering SCD1 (Stearoyl-CoA desaturase-1) expression leads to a decrease of β-catenin amounts within the nucleus and to inhibition of its transactivation capacity. SCD1 is an endoplasmic reticulum anchored enzyme catalyzing the synthesis of monounsaturated fatty acids, mainly palmytoleyl-CoA and oleyl-CoA. SCD is an important metabolic control point in the fatty acid synthesis pathway that is essential for cancer cell viability. Cancer cells are sensitive to loss SCD function. SCD1 silencing also inhibits GSK-3 phosphorylation and impairs the epithelial to mesenchymal transition-like behavior of the cells, a characteristic of metastatic cancer. In the previous article, we discussed a function for SCD1 in the modulation of signaling processes related to cancer cell proliferation and survival and how SCD1 inhibition causes cancer cell death. We now know that sterculic oil and omega-3 polyunsatuted fatty acids act as inhibitors of SCD1. Decreasing stearoyl-CoA desaturase-1 expression inhibits β-catenin signaling in breast cancer cells. β-catenin signaling is also associated with drug resistance and its inhibition is associated with increased multiple drugs cytotoxicity in various cancers. Targeting the oncogenic protein beta-catenin to enhance chemotherapy outcome against solid human cancers. Caspase-mediated cleavage of beta-catenin precedes drug-induced apoptosis in resistant cancer cells. β-Catenin-dependent lysosomal targeting of internalized tumor necrosis factor-α suppresses caspase-8 activation in apoptosis-resistant colon cancer cells. Nuclear expression of β-catenin promotes RB stability and resistance to TNF-induced apoptosis in colon cancer cells. Role of Wnt/β-catenin signaling in drug resistance of pancreatic cancer. Inhibition of Wnt/β-catenin signaling downregulates P-glycoprotein and reverses multi-drug resistance of cholangiocarcinoma. We have many β-catenin signaling inhibitors at our disposal. Methylseleninic acid (MSA), an organic selenium compound, reduces β-catenin protein levels in cancer cells and reduces/delays cancer metastasis. Moreover, MSA accelerates the degradation of β-catenin and activates GSK-3β. The enzyme GSK-3β forms a complex with β-catenin and promotes its degradation in the proteasome. MSA acts on the inhibition of β-catenin/TCF pathway. However, GSK-3β is involved in multiple signaling pathways and has many phosphorylation targets. It should therefore not be surprising that GSK-3β has both pro- and antiapoptotic roles in cancer. Lithium is an inhibitor of GSK-3β activity. Thus, lithium activates canonical Wnt signalling by GSK-3β inhibition, which in turn stabilizes cytosolic free beta-catenin, and inhibits β-catenin degradation. Indeed, lithium acts as a double-edged sword in cancer treatment. It is not easy to safely kill the cancer cells. beta-Catenin/TCF pathway plays a vital role in selenium induced-growth inhibition and apoptosis in esophageal squamous cell carcinoma (ESCC) cells. Dietary selenium supplementation modifies breast tumor growth and metastasis. Glycogen synthase kinase-3beta activity is required for androgen-stimulated gene expression in prostate cancer. GSK-3 and mitochondria in cancer cells. GSK-3β: A Bifunctional Role in Cell Death Pathways. Lithium stimulates proliferation in cultured thyrocytes by activating Wnt/beta-catenin signalling. Berberine is a bitter-tasting, yellow, plant alkaloid with a long history of medicinal use. Berberine is present in the roots, rhizomes and stem bark of various plants including goldenseal (Hydrastis canadensis), Oregon grape (Berberis aquifolium), and barberry (Berberis vulgaris). Berberine reduces cellular levels of active β-catenin and inhibits β-catenin transcriptional activity. Silymarin, honokiol, lupeol, genistein, gugulipid, resveratrol, quercetin, EGCG, lycopene, sulforaphane, ellagic acid, Vitamin D, and omega-3-polyunsaturated fatty acids also antagonize or modulate Wnt/β-catenin signaling. We believe that these natural agents that are non-toxic in nature could be used either alone or in combination with conventional therapeutics for the prevention and/or treatment of a variety of cancers. Berberine acts as a natural inhibitor of Wnt/β-catenin signaling-Identification of more active 13-arylalkyl derivatives. Silymarin targets β-catenin signaling in blocking migration/invasion of human melanoma cells. Honokiol Eliminates Human Oral Cancer Stem-Like Cells Accompanied with Suppression of Wnt/ β -Catenin Signaling and Apoptosis Induction. Honokiol inhibits non-small cell lung cancer cell migration by targeting PGE₂-mediated activation of β-catenin signaling. Lupeol inhibits proliferation of human prostate cancer cells by targeting beta-catenin signaling. Soy isoflavone genistein upregulates epithelial adhesion molecule E-cadherin expression and attenuates beta-catenin signaling in mammary epithelial cells. Targeting beta-catenin signaling to induce apoptosis in human breast cancer cells by z-guggulsterone and Gugulipid extract of Ayurvedic medicine plant Commiphora mukul. The β-catenin/TCF complex as a novel target of resveratrol in the Wnt/β-catenin signaling pathway. Quercetin inhibit human SW480 colon cancer growth in association with inhibition of cyclin D1 and survivin expression through Wnt/beta-catenin signaling pathway. Suppression of Wnt signaling by the green tea compound (-)-epigallocatechin 3-gallate (EGCG) in invasive breast cancer cells. Requirement of the transcriptional repressor HBP1. The anti-adipogenic effects of (-)epigallocatechin gallate are dependent on the WNT/β-catenin pathway. Ellagic acid coordinately attenuates Wnt/β-catenin and NF-κB signaling pathways to induce intrinsic apoptosis in an animal model of oral oncogenesis. Vitamin D and Wnt/beta-catenin pathway in colon cancer: role and regulation of DICKKOPF genes. Omega-3-polyunsaturated fatty acids suppress pancreatic cancer cell growth in vitro and in vivo via downregulation of Wnt/Beta-catenin signaling. Modulation of Wnt/β-catenin signaling pathway by bioactive food components.